With misty mornings, the smell of bonfires, shimmering cobwebs and the changing colours of the leaves, autumn is certainly a time of year when mother nature waves her magic wand. 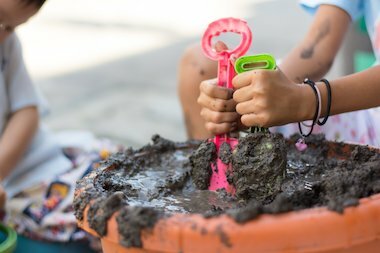 With magic in the air, this is a perfect time for young children to learn and play in a mud kitchen. The type of mud kitchen you choose will depend on your outdoor environment and indeed your budget. However, I would like to focus upon a mud kitchen that blends in with the natural environment and gives young children the opportunity to connect with nature and ignite their imagination. 2. Much More than Mud!